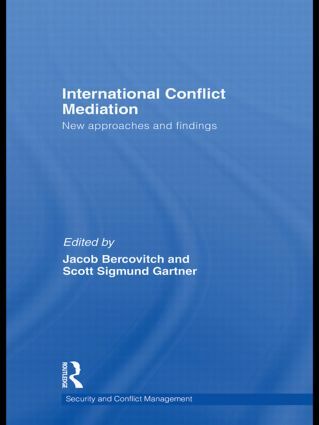 This book examines how new empirical approaches to mediation can shed fresh light on the effectiveness of different patterns of conflict management, and offers guidelines on the process of international mediation. International conflict mediation has become one of, if not the most prominent and important conflict resolution methods of the early 21st century. This book argues that traditional approaches to mediation have been inadequate, and that in order to really understand how the process of international mediation works, studies need to operate within an explicit theoretical framework, adopt systematic empirical approaches and use a diversity of methods to identify critical interactions, contexts and relationships. This volume captures recent important changes in the field of international conflict mediation, and includes essays by leading scholars on a variety of critical aspects of conflict management, using state of the art analytical tools and up to date data. This book will of great interest to scholars of peace and conflict studies, methods in social science, and of International Relations in general. Is there method in the madness of mediation?